Q... I have a thatched property. Do I need to have the chimney(s) swept every year? A... YES you do need to have a thatched property swept and importantly be quite sure in your own mind that the sweep has been right to the top of the chimney. In any case, your Insurance Company will insist on it being swept at least once a year. Most insist on twice a year or more though. Q... Stove or open fire? A... There is no real right or wrong answer here! It's a matter for personal choice. 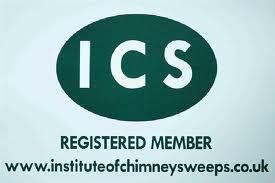 Q... How many times a year do you think I need to have my chimney swept? Q...What's the best way to look after my stove? A lot of people will spend ages polishing and cleaning the glass etc, but neglect to have the chimney swept. If it is not kept clear, then the firewill not work to its best ability and you will have ensuing problems. Q... I don't need a Carbon Monoxide alarm. A... YOU DO need an audible Carbon Monoxide alarm if you burn or use any kind of fossil fuel - gas/oil/wood/coal.You can be dying whilst the little patches are changing colour. You need to know you have a Carbon Monoxide problem immediately. Q ... How long will you be in my house? If it is a chimney we have not done before, we allow at least one hour as we do not know what we will encounter up it (ie birds nest). At the least it will take half an hour by the time we cover up and get our equipment in (especially if we have to carry over some distance). Q... How do you sweep the chimney? Q Birds nests. I have one in my chimney. Can you get rid of it? A... Birds nests are all part of a chimney sweeps work. However, there rules regarding the removal of a nest which is known to have eggs or chicks in. We will refuse to remove a nest if this is the case so between late Feb/March and August, be extra vigilant. If you know birds are building a nest (the jackdaws, which are the ONLY birds to build in a chimney, are easy to spot going to and fro the pot) during the early part of the year then CALL US THEN. We can remove the nest and if necessary either fit a cowl or pass you the details of someone who can. A one off payment for a cowl is much cheaper than several visits by the Chimney Sweep! Q... Do you do weddings? A... We have been asked this question many times and the answer is NO...but we know a man who can!! Q...What other services do you provide?